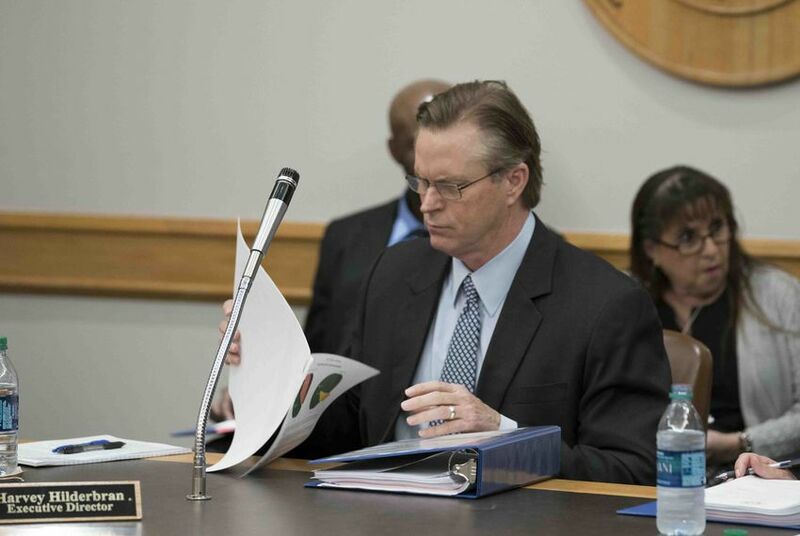 Former state Rep. Harvey Hilderbran is out as executive director of the Texas Facilities Commission, the billion-dollar agency that builds and maintains state office buildings. The seven-member board that oversees the commission voted 5-2 Thursday morning to oust Hilderbran about a month after a Texas Tribune investigation found the agency was gripped by internal dysfunction, largely because of Hilderbran’s management style and lack of experience running a large organization. Hilderbran was fired less than a half hour into the agency's meeting Thursday. Board Chairman Robert Thomas moved to meet in executive session right after gaveling the meeting to order and introducing three new commissioners who had been appointed in December and January. At 10:22 a.m., he moved to fire Hilderbran. Commissioner Mike Novak of San Antonio seconded the motion. Hilderbran was asked to proceed to his office and Thomas instructed “DPS officers who are here" to follow him. Deputy Executive Director John Raff was appointed interim executive director. Commissioners Patti Jones and Jack Perry, who have supported Hilderbran in past meetings, were the only commissioners to vote against his termination. The board recessed a few minutes after Hilderbran's termination. "I had no idea this was going to be on today's agenda," Jones said after the vote. "Big surprise. It's a shock. No notice whatsoever," Perry said. In a written statement, Hilderbran told the Tribune that serving as the commission's executive director was an honor. "I am proud of the work we did there and am grateful to the team of professionals that I was privileged to lead," he wrote. "I always personally received evaluations of 'good' or 'better' during my tenure, so today's decision was surprising, and in my view, unwarranted." Hilderbran said he believed his termination was "done in violation of the Open Meetings Act, as I was not given proper notice or given the opportunity to request a public hearing as required by law." Hilderbran told the Tribune that eight people in addition to him were either fired or resigned Thursday. "These are talented, hard-working state employees that were forced out and they didn't deserve it," Hilderbran said. Thomas told the Tribune that personnel changes were necessary to right the ship at the agency. Asked how many people resigned or were fired Thursday along with Hilderbran, Thomas said he couldn’t discuss personnel matters and referred those questions to Raff, the interim director. Raff declined comment Thursday evening and said he could give more information at a later time. Nearly half the board’s members – political appointees chosen by the governor, lieutenant governor and House speaker – have been replaced since late December. In previous meetings and in records obtained by the Tribune, the board had appeared locked in a stalemate, with half supporting Hilderbran and half critical of his leadership. The three new commissioners – Steven Alvis, William Allensworth and Rigo Villarreal – voted to fire Hilderbran, who previously served more than 20 years in the state Legislature. Alvis’ predecessor on the board was Joe Slovacek, another Patrick appointee who forcefully criticized Hilderbran in public meetings and in emails obtained by the Tribune. Records show Slovacek and other commissioners were alarmed by what they described as Hilderbran’s attempts to quash internal dissent, his refusal to let internal auditors do their work and his failures to rein in strife that could derail high-profile construction and maintenance projects. The friction came to a head in an August meeting when Slovacek made a motion to hire a chief operating officer, a position some commissioners considered key to righting the ship at the agency. In records obtained by the Tribune, those commissioners complained Hilderbran had backtracked on an agreement to fill the operating officer job, instead hiring a director of operations. “To be very clear, I don't want to divide our board,” Slovacek told Thomas at the August meeting. “What I want Harvey to tell me, does he support what he told you and Mike [Novak]: Yes or no? Do you support hiring a COO? Yes or no?" Hilderbran said he would follow the commissioners’ direction and, after a lengthy back-and-forth, Slovacek withdrew his motion. For about an hour after the commission went into recess, several other staff members were seen walking to the elevator bank with their belongings in tow. Among them was Debbie Van Bibber, Hilderbran's executive assistant, who said she had been fired at the direction of Raff.